One of the things I’ve had to get used to about living in Japan is the existence of a rainy season. As I write this review, we’re coming off a solid week of rain. It rains all night, it rains all day, breaking just long enough to convince you to leave your house without an umbrella before recommencing in full swing. It’s an annoying part of every year because it’s really hard to get things done when it’s raining all the time. The positive side of that situation is that sometimes you really can’t get anything done, and you are kind of forced to relax inside your house with nothing but time on your hands, a bit of a rarity in adult life. 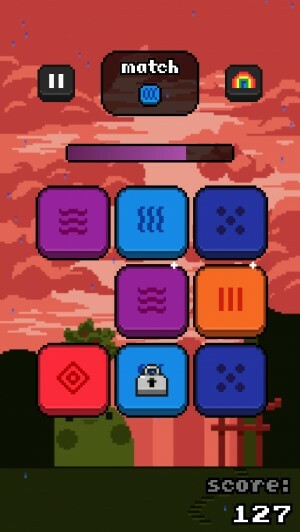 I have no idea if it was the intention of the developer, but Rainblocks (Free), the new puzzle game from Subaku (Free) creator Let’s Playing, very much feels like a rainy day in some ways. If you’ve ever played one of those puzzles where you’re sliding numbered tiles around trying to put them in numerical order, that’s a good starting point for the concept of Rainblocks. Blocks corresponding to the colors of the rainbow are laid out on a 3 x 3 grid, with one space left open. The game will indicate a color to match, and you’ll have to move the blocks around until you can get both blocks of that color to touch. There’s a timer constantly ticking down, and when it runs out, you’re finished. Making matches staves off the timer, and after making a certain number of matches, you’ll level up and your timer will get a big boost. As you play, power-ups and power-downs will appear, with the balance tilting more towards the latter the longer your game goes on. The only goal is to get as high a score as you possibly can. Making careful moves, along with the occasional bit of luck, can help you set up chain combos that earn you extra points. The game is mostly about quickly identifying the best route to shuffle your blocks along to avoid wasting time and picking up unwanted items, however. The items appear on top of blocks and are activated by moving the block they’re attached to, so they’re easy to activate accidentally if you’re not paying attention. You can clear an item off of a block by matching its mate to it, but that clears good items just as easily as bad ones, so you’ll want to be careful there as well. Certain effects are automatically activated when they appear, such as locks that prevent you from moving a block or ice that must be chipped away by repeated taps before the block can move again. While I can’t say I’ve played a game with these exact mechanics before, sliding tile puzzles have become pretty popular on iOS of late, so the broad gameplay doesn’t stand out as strongly as it might have six months ago. The timer does add a bit of pressure, preventing you from taking your time and encouraging you to keep moving, but it’s also kind of a non-factor for quite a ways into each play. You start with quite a bit of time on the clock, and level up fairly frequently, so until the game kicks into high gear after a few minutes, your timer will probably stay topped off most of the time. Where the game stands out more clearly is in its presentation, as Rainblocks has a look and sound quite unlike most games in this sub-genre. While games like Threes! ($5.99) and SideSwype ($0.99) go for a clean, modern visual design, Rainblocks embraces a colorful pixel-art motif that wouldn’t look out of place in a Super NES game. The music adds to that feeling, with the game’s theme provided by Manami Matsumae, whose name may not be familiar to many, but whose work is probably familiar to anyone who played games in the NES or SNES era. She composed for many games, including one of my personal favorites, U.N. Squadron, but her most famous work is her soundtrack for the NES classic Mega Man. It’s that game that the theme for Rainblocks seems to call back to the most, with a light, bouncy melody that stays in your head long after you’ve stopped playing. Lots of games try for a retro aesthetic to varying degrees of success, but Rainblocks is one of the rare ones that actually feels like it was yanked out of the early 90s Japanese gaming scene. The presentation is rounded out with Game Center support for leaderboards and some very interesting achievements. Owing to the increasingly frequent appearance of items throwing a spanner into the works and the pressure of the timer, Rainblocks has a nice feeling of progression that some puzzle games lack. The game reaches a point where the tension feels just right, and every suddenly-appearing ice block or lock puts you into a state of temporary panic that adds greatly to the excitement. This actually leads to my biggest problem with the game, however. The game takes a while to wind up, and as a result, that period where the tension is low feels like it runs on a good bit longer than it should. The last couple of minutes of each session are so much fun, it feels like a bit of a bummer when you have to start over and get through the easy portion again. Most puzzle games give you an option to start on a higher level if you want, and I think that’s something Rainblocks could benefit greatly from. Still, it’s hard to complain too much, especially since the game is free, with unobtrusive ads you can get rid of for a dollar with the game’s sole IAP. Like a rainy day, it’s initially very relaxing, sometimes feels like it’s going on a bit too long, but somehow in the end feels a bit soothing. Even though it has some issues with the pacing of its gameplay, Rainblocks offers a lot of frantic fun, all wrapped up in a comforting, up-beat package. It’s not quite as clever as Subaku, but it’s considerably more polished and certainly interesting enough in its own right. I enjoyed the game’s take on sliding puzzles quite a bit, and would certainly recommend trying it out to any puzzle game fans. Next PostNext ‘Get Fiquette’ Review – What If Batman Saw A Brick Fly Through His Window?